Cedar Rapids, IA - Here we are, the middle of January and the race season has started (Is there really an off-season?). 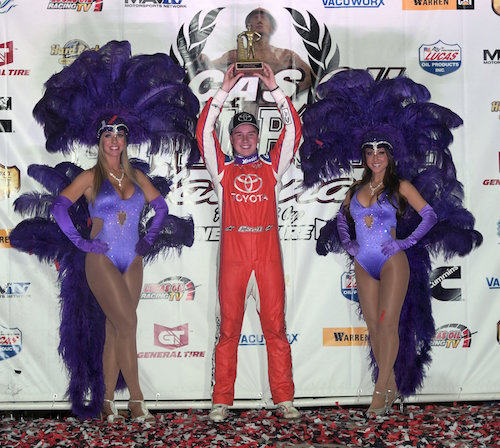 Christopher Bell won his third Chili Bowl Nationals' title on Saturday night, January 19, winning on a last lap pass over Kyle Larson. Schedules for tracks and series are starting to pop up, including most of the major late model tours for the Midwest - Deery Brothers, SLMR, and MLRA. On one of the local racing forums where the less-educated can speak openly and still not make their point, one chap thought that the April 12 opener at Davenport for Deery Brothers Summer Series wasn't early enough. "It's not early enough, we could have an early Spring" was his reasoning. Okay....I'm gonna step out on my limb here and say that two of the first three Deery shows (April 12 - Davenport, April 13 - Maquoketa or April 14 - Dubuque) get canceled due to rain or soggy grounds or a combination of both. I've always secretly thought (well, it's no secret now) their was a conspiracy amongst some promoters. They schedule their March/April specials knowing full well that the chances of cancellation are much greater than if they were to schedule a special event in May or beyond. It's almost like they want it to fail - they don't actually want the event to happen, they just want the casual fan to see that, on paper, that said promoter is making an effort to schedule a early-season special. Secretly, though, that promoter is saying to oneself, "Well, at least the casual fans thinks I'm making the effort to host a special event at the track. Hopefully, it rains (or snows) and I don't have to go through with it and then I can tell the casual fan, "Oh well, I tried but it just didn't happen. Maybe next year." Well, Mr. Promoter.....even though most of the dumb asses are buying your story, I, for one, are on to you. There will be no Deery show at Marshalltown this season, which is fine by me. I love Marshalltown Speedway and I think it's a racy joint, but it's not....and I'll say it again, not a late model track. I've been to the last 4 Marshalltown Deery Brother shows and it's been nothing but freight trains races. The same can be said for Boone as well. Modifieds, sportmods, stock cars and hobby stocks will give you a great race almost every time, but late models are stagnate for the most part. Again, I've been to the Memorial Day Deery Brothers show for the last few years and I always walk away disappointed. The fact is, for the first time in a few years, I'm very pleased with the 2019 version of the Deery Brothers Summer Series. I think it's solid from top to bottom with a lot of variety. Yes, I hope they do have great weather for those early shows in April....I'm just sayin'. A dumas spouted off on another forum asking why they don't have Frostbusters for late models. The question was, "Why don’t they have any Frostbusters for the late model class? With so many more specials for the IMCA mods why not give the late models a few more better paying shows?" Your answer is basic math. For every 1 late model in the state of Iowa (or Illinois or Missouri or Nebraska) their are (and I'm guessing here) 6 modifieds (or sportmods), So that being said...Who do you think promoters are going to cater to? That 1 late model driver over here or those 6 modified drivers over there? I'm going with "over there". The only issue I have with the MLRA schedule is, where's Donnellson? I had come to believe that Donnellson was a popular venue for the MLRA...perhaps I'm mistaken? I do, however, like the additions they've made this season with Stuart, West Liberty and Dubuque. Let's hope those three tracks get great crowds and even better car counts. Speaking of Stuart Speedway - Congratulations go to Mike Van Gendren and his purchase of Stuart Speedway. It's onward and upward for this track under the leadership of MVG. I like the idea of racing Wednesday night's there and I also like what they did by scheduling in a couple of late model races as well. Expect big things at Stuart Speedway in 2019. I do hope, for my own personal sake, that Mike continues to run Vinton on Sunday night. I know that technically it Mick Trier's track, but the last few seasons he's had Mike actually running the show and I don't mind saying, we're all getting a little spoiled up there in the City of Lights. The Malvern Bank Super Late Model Racing series is branching out this season and moving farther east, with stops at Stuart, Marshalltown and two trips to Hamilton County Speedway. The SLMR series has always been "Nebraska-based" so to speak, so I hope the drivers that support the series on a local basis make the effort to go a little further out of there way to support the series. I really hope that fans come out as well - I've had the opportunity to witness SLMR events several times and this is a first rate series.